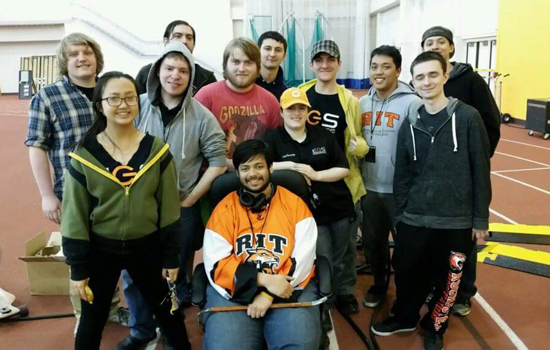 Alejandro Rivero, president of Electronic Gaming Society, with a group of members at last year’s spring LAN party. Alejandro Rivero, president of the Electronic Gaming Society, will kick off Fusion Fest 2016, the society’s second LAN party to benefit charity. All proceeds from the 24-hour video gaming party this weekend go to Cancer Wellness Connections, an organization that provides chemotherapy patients with diversionary activities such as games as a form of pain distraction. With more than 300 members, the gaming society is one of the largest clubs on campus. Rivero hopes to continue growing the club and spreading its mission through social media marketing and campus events. The Brooklyn, N.Y., native also is an Information and Technology Sciences ambassador for his major. Answer: In high school, I was an IT tech for the school. My boss always told me I had a knack for networking, so I searched the country for schools that had networking degrees. I found a lot of schools with IT and computer security programs, but RIT actually had a program focused on networking, so it was my No. 1 choice. I also really liked the size and layout of the campus. Q: How did you get involved with the Electronic Gaming Society? A: I ended up just stumbling into the first weekly meeting my freshman year and I thought it was really cool. Before coming to college, I was a nerdy kid and I was determined I wasn’t going to be that nerdy kid anymore. Then I saw the club and really fell in love with it and became a member and helped out a lot. Last year, I became LAN officer and coordinated all the LAN events. This year, I’m president of the club, so I get to make the big decisions and steer the ship. Q: What is the mission of the club? A: The mission is to create a community where gamers of any kind can come and have fun. If you like Pokémon, there’s a group for that. If you like Minecraft, there’s a group for that. We always encourage people to start new subgroups and we have gotten a lot of action on that front recently. This is surprising because subgroups as a concept are really new to EGS. When I was a freshman, there was only one subgroup. Now as president there are six subgroups, so it’s grown exponentially. Q: What are some of your goals as president? A: I want to market the club more and make sure more people on campus know what EGS does. We have a decent virtual presence. Our Facebook page is updated every time we have a weekly meeting or upcoming event. We have a Twitter that auto posts everything from Facebook but I would like to use that more personally. I also want to do more events like Fusion Fest on campus. Q: Why did the club decide to host Fusion Fest? A: Fusion Fest was a pet project of mine last year. Cancer Wellness Connection had contacted MAGIC about doing a gaming event because playing games can dissipate the effect of pain. MAGIC knew EGS was really good with gaming events so they contacted me. Then I convinced the EGS president to do a LAN party for charity. For me, cancer is a very personal issue because a lot of my family has been affected by it, so being able to raise awareness through gaming is great. Q: What was the community’s response to last year’s event? A: Last year 60 people attended and we raised about $8,000. The event got so much more press than I could ever have imagined. President Destler showed up two times. A local news station did a piece on us and RIT Production Services did a video, too. Q: What new features did you add for this year’s Fusion Fest? A: This year we are going to be able to do a full online streaming schedule inline with the LAN. We have a Twitch link and we are going to be doing shows on there the entire time so people who can’t make it to the event in person can still take part and donate. We also are going to have a wellness activity where gamers can take a break from gaming and participate in an exercise activity. MAGIC will be featuring their game as well. Q: What do you hope participants gain from the event? A: I hope that everybody who participates has a good time and wants to come back and spreads the word to their friends. The long-term goal is to make it a yearly event. Q: Are there any other events the club is planning for this semester? A: We have our spring LAN party, which is our big celebration that we do in the middle of April. We also have several tournaments in the next few weeks. Our subgroups host their own activities, too, so there are always things going on. Q: What advice would you give new students who want to get involved with clubs? A: The main thing is figure out what you love to do and I’m sure there is a club for it. If you play games every day, EGS is the club for you. If you like to play cards, the Rochester Wargamer Association and Guild is the place for you. If trains are your thing, there is a model railroad club. Getting involved with a club grows in value with every year you’re here, so it’s something a freshman student really needs to do. Traci Turner compiles “Student Spotlight” for University News. Contact her at trt6538@rit.edu with suggestions.